A casement window (also referred to as a crank-out window) has a single sash that opens outward on a vertical axis by rotating a crank that is attached to the sash with heavy duty hinges. The hinges can open the sash to a full 90 degrees allowing for easy cleaning from inside the home. A multipoint locking system closes the unit tightly from a single lever. 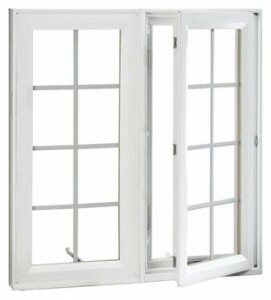 The casement is the most energy efficient of all operable window styles. Casements may be joined together into double, triple or quadruple units. Hard-to-reach areas like over a kitchen sink or in a projecting window like a bow or bay are excellent locations to consider installing a casement window. The single crank operator can open and close the window with ease. A casement window will allow more light and visibility than other styles. All of our windows are custom built, all jams and sashes are welded, plus our products purchased with the Low E/Argon Glass Package meet Energy Star Guidelines. Energy Star® is the government-backed symbol for energy efficiency, providing simple, credible, and unbiased information that consumers and businesses rely on to make well-informed decisions about energy efficiency. So, when purchasing windows from Window Source of Springfield you can be certain that you are making the choice that will not only beautify your home, but will be friendly on your wallet and the environment.